Thank you Alessi for sponsoring this post for Baked Pesto Pork Meatballs! 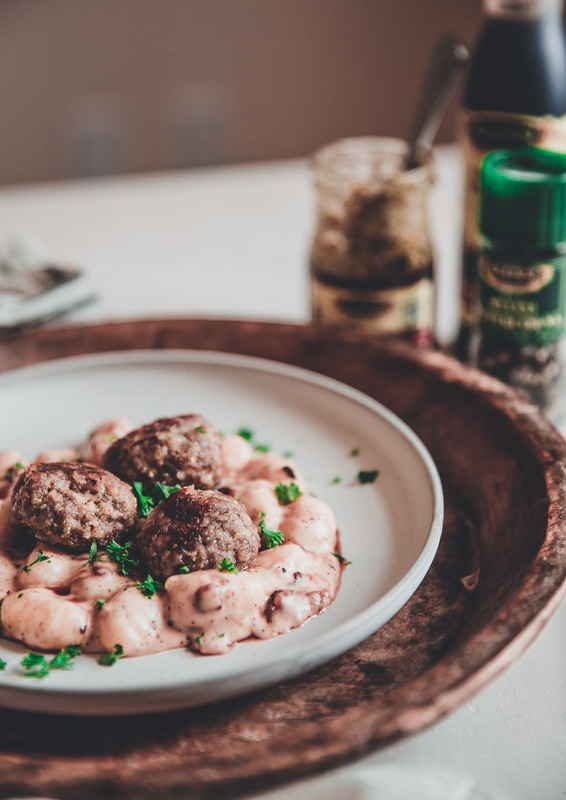 Ground pork meatballs are seasoned with Alessi pesto and served with gluten free gnocchi tossed in a creamy bacon porcini mushroom sauce makes for a delicious and elegant main dish. Simple to make, economical and it puts the wow factor into your home cooked meal! Save 15% on Alessi products in the Alessi Store using code THISGAL! Hi folks! 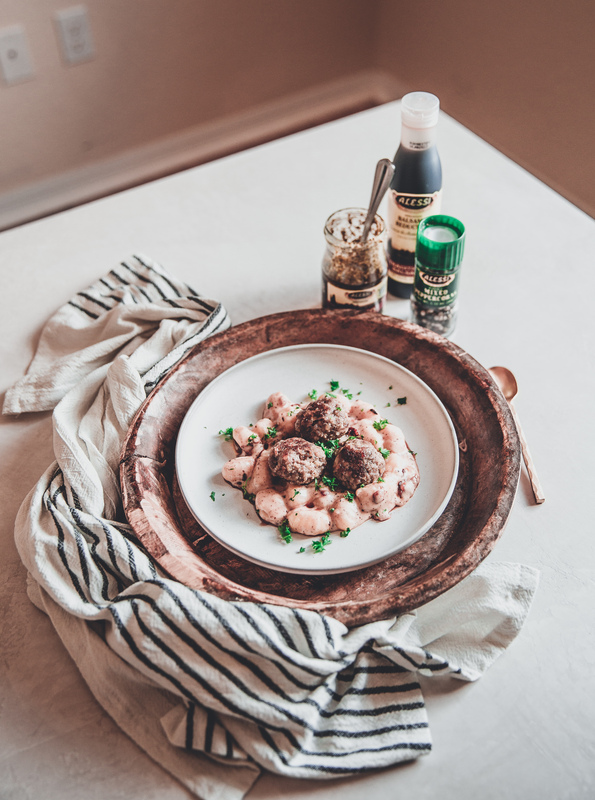 I am excited to be working with Alessi to bring you this elegant Baked Pesto Pork Meatballs and Creamy Gnocchi recipe. I made the recipe using some of my favorite Alessi products and some new to me Alessi products. 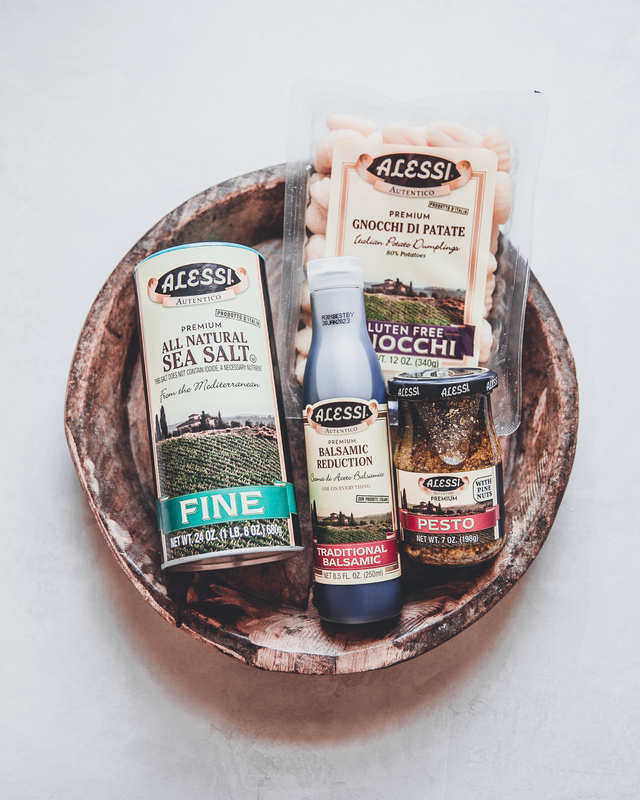 You can always find Alessi sea salt and Alessi vinegars in my pantry and now you’ll find Alessi dried porcini mushrooms, Alessi Balsamic Reduction and Alessi Gluten Free Gnocchi in my pantry as well. 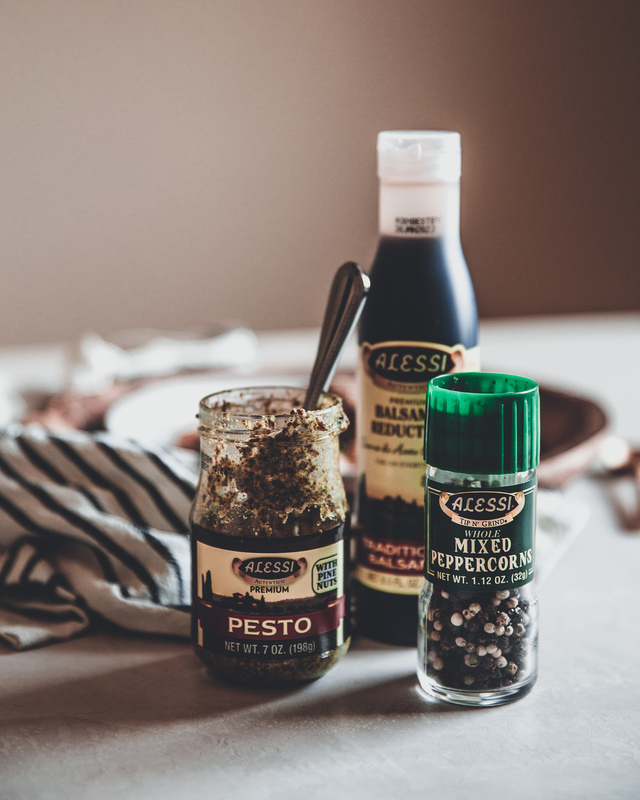 My local grocer does not carry all of the vast variety of Alessi products on its shelves but luckily, Alessi has a great online store where I can purchase pantry staples and have them delivered right to my front door. For you my readers, I am giving you 15% off your purchase at the Alessi online store using the code THISGAL. What will you purchase with the 15% savings? 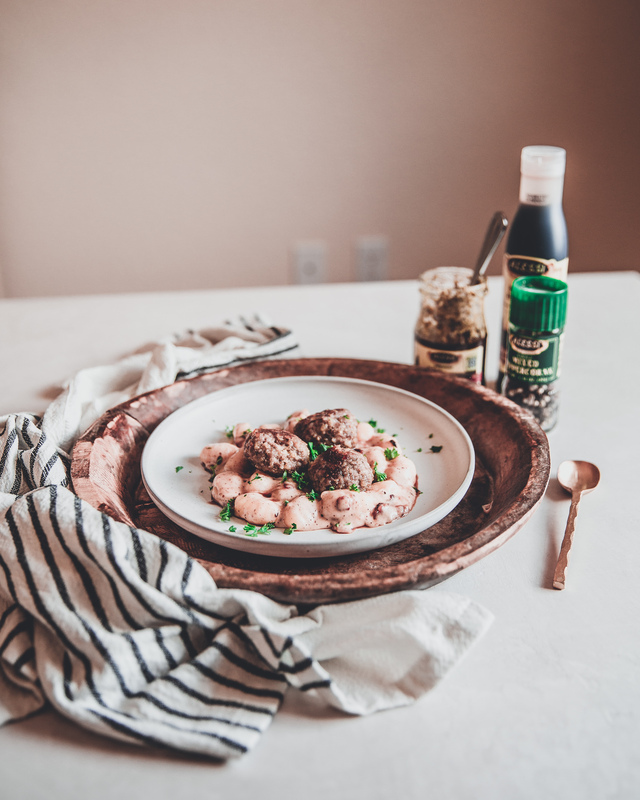 I made these baked pesto pork meatballs with pastured ground pork, Alessi Pesto and gluten free breadcrumbs. Then I baked them on a parchment lined baking sheet at 375 degrees for 30 minutes. While the meatballs were baking, I made a creamy sauce using milk, half and half, uncured bacon, porcini mushroom powder (made by grinding Alessi dried porcini mushrooms) and garlic. 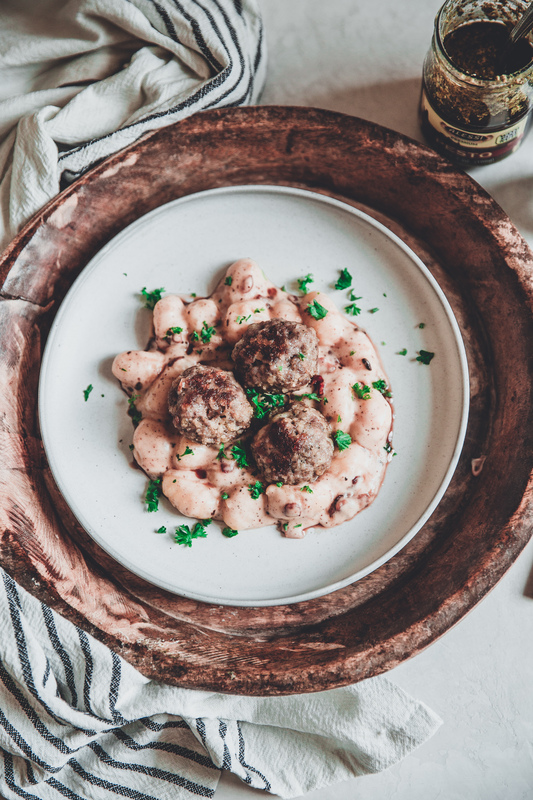 I tossed the cooked Alessi gluten free gnocchi in the sauce and served it with some of the baked pesto pork meatballs. Then I drizzled the meatballs and pasta with Alessi balsamic reduction. SO GOOD! Make the meatballs by combining the ground pork, pesto, salt and bread crumbs. Mix well. Then form into approximately 1.3 ounce meatballs (makes about 15 meatballs). Place the meatballs on the parchment lined baking sheet and bake at 375 for 30 minutes. Flip the meatballs halfway through baking to keep a consistent shape (so they don't end up flat on one side. Heat a large sauce pan or skillet over medium high heat. Add the bacon and cook until crisp. Reduce heat to medium and add the garlic and butter and stir until the butter is melted. Be sure to not burn the garlic. Sprinkle the mixture with the tapioca flour and mushroom powder. Stir until combined. Gradually add the milk and half and half, stirring or whisking constantly until all milk/half and half is added and the mixture is smooth. Taste and add ancho chili powder and salt to taste. Add the gnocchi to the sauce and mix well until coated. Divide the gnocchi/sauce mixture between two plates or large bowls. Top with 3-4 meatballs. Save remaining meatballs for another meal, meatball subs or another pasta dish. Or serve as an appetizer!